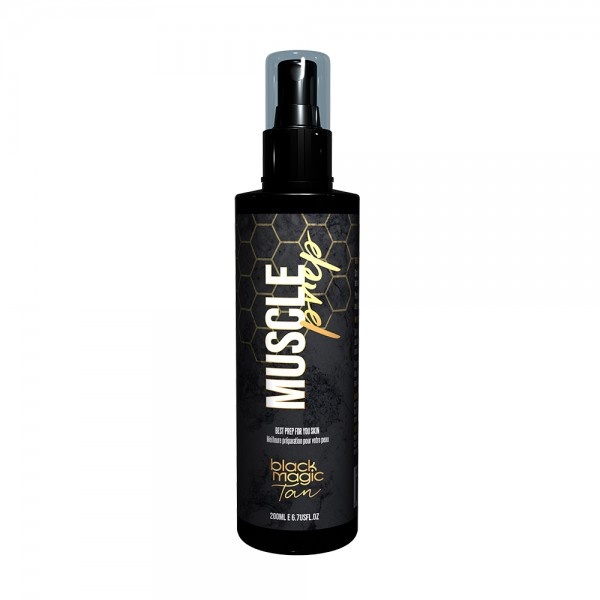 Muscle Prep is a body primer designed to rebalance the pH levels of the skin, lock in moisture, and minimises pores. pH stands for “potential hydrogen” and is used to describe the acid-alkaline ratio of a substance, which ranges from 0 (the most acidic) to 14 (the most alkaline). The health of your body and skin is directly linked to maintaining the right balance between acidity and alkalinity. “The skin’s barrier, which is known as the acid mantle, is responsible for keeping in lipids and moisture while blocking germs, pollution, toxins, and bacteria. To work its best, the acid mantle should be slightly acidic, at a 5.5 pH balance. When it’s too alkaline, skin becomes dry and sensitive; you may even get eczema. You may also experience inflammation. Keeping the pH balance of your skin in the neutral zone means your skin is in the best possible condition for your spray tan. Spritz on with pump onto the dry tan and allow to dry before applying base coat or top coats. Product can also be sprayed on with a help spray gun and dried with air from machine.